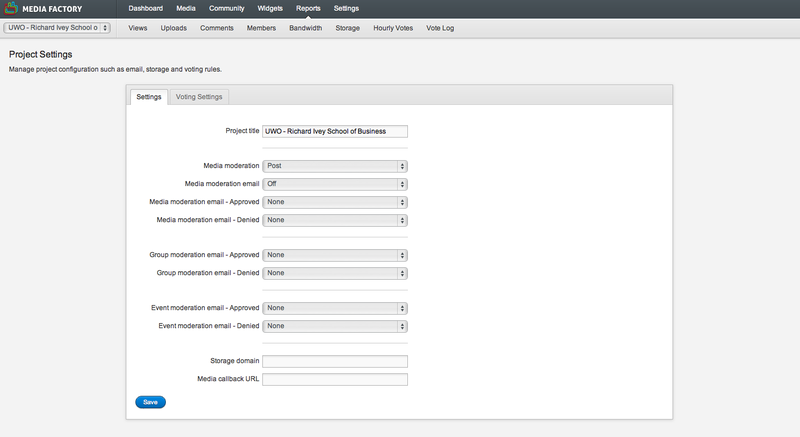 Use the Project Settings page to configure key project and vote settings. Note: To access this page you need administrator-level permissions. Notify your Project Manager if you need access and do not have it. To access Project Settings from the top navigation, select Settings > Project Settings. Media moderation email templates are channel specific. In the Navigation bar, select Media > Channels, select a channel and choose the Approved or Denied moderation email template. By default, storage.filemobile.com ( or storage-eu.filemobile.com, storage-au.filemobile.com, storage-ca.filemobile.com if you are using an EU, AU, or CA instance of New Spark Platform) will be used as the base domain for serving media files. If you're using a CDN and it's setup to use storage.filemobile.com as an origin you can use this setting to automatically change the base domain. Don't forget to end this URL with a slash. If you are unsure which "instance" your project is being hosted on, simply email your New Spark contact or support. Be the first to comment on Project Settings.